Homemade idli sambar powder – Idli sambar can be prepared in many ways. But most of the people like hotel idli sambar ( restaurant style idli sambar) as it has got a special flavor.Usually my Mom & MIL makes Idli sambar adding freshly ground spices in addition to our usual Kuzhambu milagai thool/sambar powder just like hotels. My mom calls this powder “Mel podi” in Tamil. 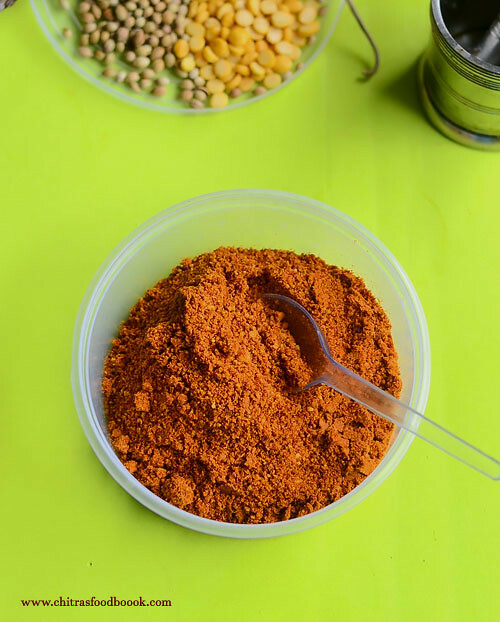 My MIL makes this sambar podi every time freshly whereas my mom makes this powder in bulk quantity and stock it for a week. 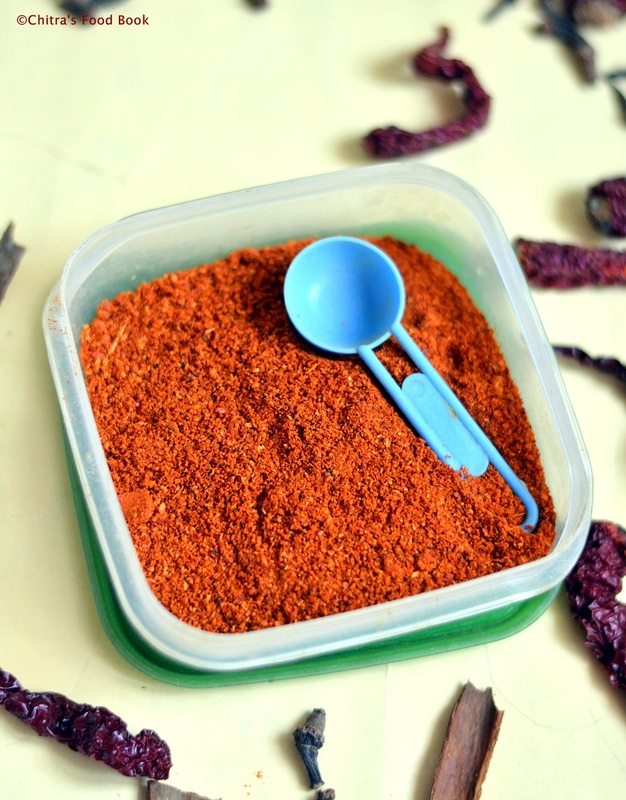 She adds this powder to idli sambar and lunch sambar as well. Its a very simple recipe with just 5 ingredients. Sendhil loves hotel style idli sambar as it is more flavorful than the plain idli sambar. But most of the time especially during busy morning hours, I make a simple onion sambar for idli without adding mel podi. 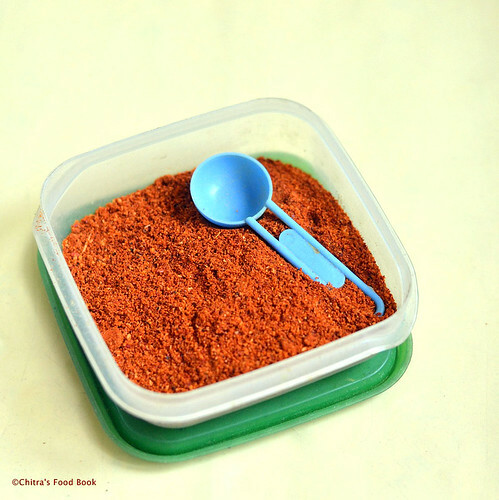 Recently my mom suggested me to grind and store this idli sambar powder and use it whenever needed. 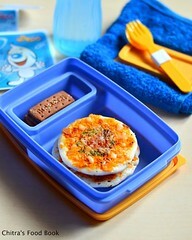 I gave a try and it really helped me for quick & easy cooking. Its smell & flavor lasted for more than 2 weeks even though I made in small quantity. 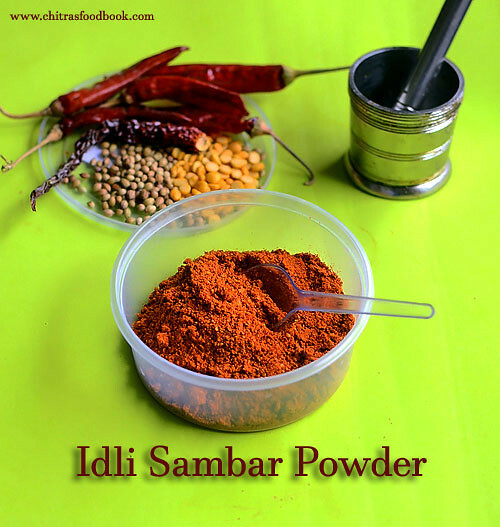 If you have leftover lunch sambar in hand, you can add this powder to convert into idli sambar. 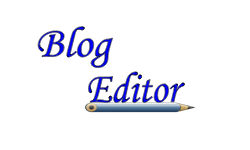 Check out Notes section in this post. I have shared in detail.Friends, do try this idli sambar powder and make restaurant style sambar at home easily. Lets see how to make it. For variations you can few curry leaves while roasting. Dry grated coconut can be added while grinding but not more than 1 tsp. In a small kadai, heat oil. Add the methi seeds, when it starts to sizzle add the chana dal, pinched red chillies, cumin seeds and dhania seeds.Roast everything in low to medium flame. Make sure no dals or spices are burnt. Let them cool down. Grind everything to a fine powder. Store in an air tight box and use it whenever needed. 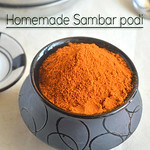 This sambar powder stays good for one week if stored in an air tight box. 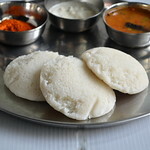 Please refer my HOTEL IDLI SAMBAR post for the procedure of making sambar. In that recipe, I have shared the ingredients of spices to roast & grind. No need to make that powder. 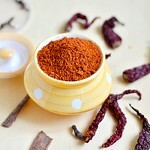 Instead add 1 tbsp of this sambar powder at the end.Give a boil.Switch off the flame and garnish with coriander leaves. If you have left over lunch sambar in hand, you can easily convert that into hotel style idli sambar. For that : Season mustard seeds, cumin and curry leaves in ghee ( Add chopped small onions if needed). Add 1 tbsp of this idli powder in the ghee,saute for a second and add to the left over sambar. Dilute 1 tbsp of besan flour in 1/4 cup of water. Add to the sambar. Mix everything well. Let the sambar boil nicely. 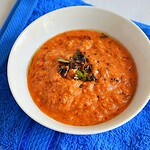 Check for taste and add more salt or sambar powder if needed.Enjoy ! Note : In this recipe, I have used less number of chillies. So I add either green chilli or add some sambar powder or red chilli powder for extra spiciness. So please add more chilli powder or chillies as per you need. 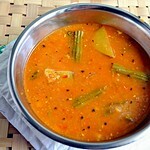 Try to prepare this sambar 1-2 hours before serving. This standing time helps for all the flavor to enhance while serving. 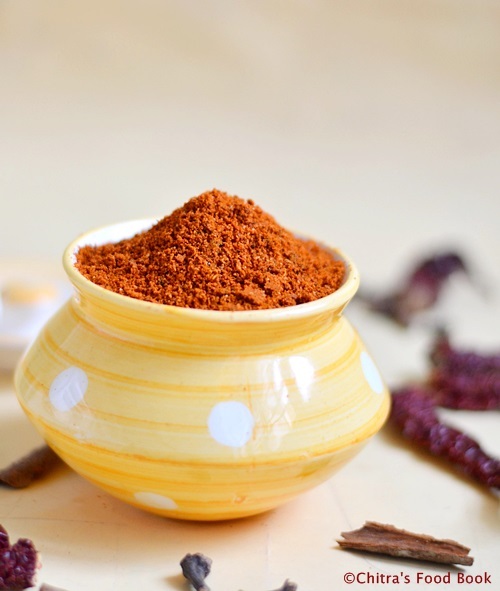 You can use this powder for making sambar 3-4 times. 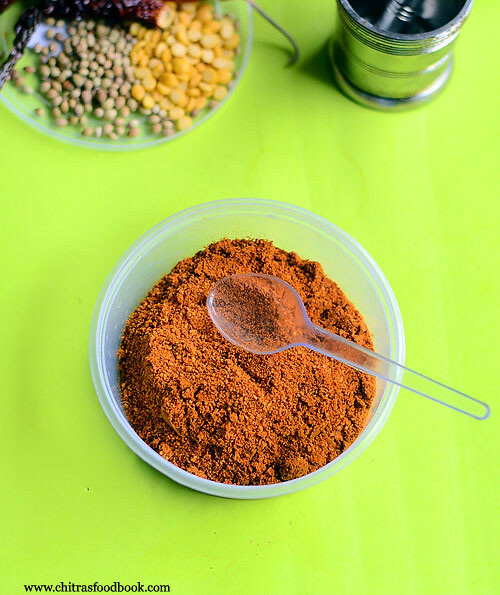 Try this homemade idli sambar powder and share your feedback with me. I am a big fan of Vengaya Vadagam/ Small onion vadagam since my childhood.This younger generation people may not be aware of this traditional recipe and slowly its forgotton by our people :( When I was young, my dad used to buy a packet of thalippu vengaya vadagam from an Iyer mess every year during summer. My mom adds it in Thuvaram paruppu sadam, Kootan choru and we love to have it as a side dish for curd rice too. . After marriage, I was amazed to see my MIL making Kari vadagam/Vengaya vadam on her own. She says its a very simple recipe preparation and can be easily made at home. Our job is to just mix and make balls. Sun will do the remaining part, she says funnily. Since Sendhil is not fond of vadagam, she stopped making it for some years. This year, I requested her to make this yummy onion vadagam for me. Last week we prepared it in Bangalore. I felt the chopping part and sun drying part takes more time. But the end result will be worth the wait. It came out great with wonderful aroma while frying. Iam enjoying it by making vadagam chutney/thogayal and use it for tempering Vatha kuzhambu and Kootu varieties. Nowadays my lunch smells divine because of this vadagam. You too give a try and feel proud to make your own homemade vengaya vadagam recipe. 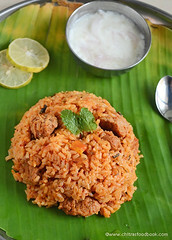 Lets see how to make this easy and yummy Thalippu Vadagam/ Kari vadam at home. Check out my Koozh Vadam, Killu vadam and Javvarisi vadam too. Wash and soak the white urad dal for 30 minutes.Wash and peel the small onion and curry leaves.Chop it finely. Peel and chop garlic cloves. Measure them in a cup. Take everything in a wide bowl. Mix well. To this add, mustard seeds, methi seeds, toor dal, cumin seeds, salt, red chilli powder. Mix well using your hands. Drain the water from the soaked urad dal and grind it coarsely without adding water. Dal should be coarse. Now mix the dal with onion mixture tightly and make balls of small lemon size. Let it dry under the Sun for a day.Coarse Urad dal paste acts as a binding agent here. So do not skip this step, If you wish, you can spread the mixture as it is without making balls and sun dry them. In that case, take the required amount of dried vadagam, keep in a separate bottle and use it. Reserve the remaining vadagam without touching often because there are chances of getting worms quickly. On the same day night, take the partially dried balls. Break into crumbs and add castor oil to it. Mix well and make tight balls again. Let it dry over night under the fan. The next day, sun dry the balls.As the balls dry, it will loosen. So roll it tight everyday. Repeat the same process until the balls dry completely and becomes black in color. It will take nearly one week to 10 days to for the balls to dry depending on the weather/heat. For me, it took nearly 10 days. My MIL says it takes a week in Salem. After the balls are dried well, store in an air tight box. For adding this gravy, take one ball, break into small pieces and fry in oil until it emits a nice aroma. 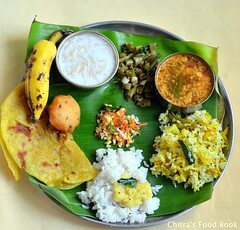 Add to vatha kuzhambu, Kootu and poricha kuzhambu recipes. 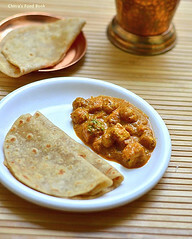 Try these yummy, flavorful vadagam at home and enjoy your lunch ! Last year i shared my mom’s Tirunelveli style ginger legiyam recipe/Inji legiyam as easy deepavali marundhu recipe.But i wanted to try the actual Diwali marundhu recipe at home for long time. Recently i bought deepavali legiyam from Salem “Home foods” as suggested by Sendhil’s friend.As we liked its taste very much, this time i made diwali legiyam on my own referring my cook book and Chitra amma’s kitchen recipe. I made it using the ingredients which i had in my pantry.Also i din’t want to go for soaking version as i had less time in hand.So i dry roasted everything,ground & prepared diwali marundhu powder and then i made legiyam with that powder.It came out very well.I won’t say this is the authentic version because i have not used some important ingredients like kandanthipili,arisi thipili etc.But i am sure this will help for digestion of oily & ghee rich sweets and snacks we relish for Diwali.Do try this deepavali marundhu recipe.Its not that much difficult to make as i thought.Anybody can make it easily .Just have a tsp of it in empty stomach for 3 days.It keeps u free from indigestion issues . I wish all my friends & readers a very happy Diwali.Thanks a lot for trying my Diwali recipes and sharing pictures with me.I am really touched .Do shower your encouragement and support always ! Last week when i went to Salem my MIL gave me this homemade mixed millet powder/Energy mix powder and told me to prepare Dosa or porridge for our breakfast/dinner.She also told me the quantity & the procedure of making it.I never thought its so easy to make.Sorry,I couldn’t take stepwise pictures.I will try to add it soon.Yesterday i made dosa with this flour and it came out very well.I was very happy & contented to get the benefits of all millet/sirudhaniyam in one recipe .Sendhil told me to blog this recipe as it may be useful to many of you.So here you go,my MIL’s mixed millet flour aka millet sathu maavu recipe for you all.But this powder is only for adults and not for kids.U can make any number of variations by adding moong dal,nuts and rice too.U can prepare all our south Indian breakfast recipes like porridge,dosa,kozhukattai,adai & paniyaram using this flour.Next week i will try to share some yummy recipes using this millet powder. Till then check out my detailed post on millets and its varieties with its health benefits. 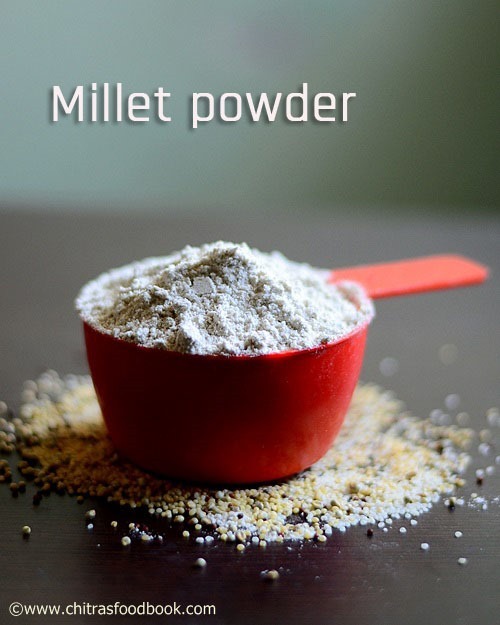 Energy mix powder recipe using millets for healthy breakfast and dinner ! Clean the millets in muram if u suspect for any debris. Heat a wide kadai and dry roast all the millets one by one.Stand nearby & keep mixing without moving around else it may burn as they are very small in size.Keep the flame medium high.Each millet takes maximum 3-4 minutes to get roasted. Roast them one by one till its color changes slightly and u get a nice roasted smell.Collect them in a plate and let it cool. After it cools down,grind them in a flour mill or mixie.Sieve it and spread the flour in a paper to cool down.Store in an air tight box.Stays good for months ! U can make sweet or salt porridge,Dosa by adding buttermilk,adai or even kozhukattai too ! Roasting the millets gives a nice flavour to the powder.Don’t skip it but be careful while roasting.Do not burn them. 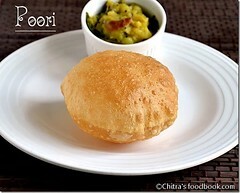 For variations u can add roasted green gram dal or yellow moong dal.U can add rice too. Nowadays Garam masala powder has become an important ingredient in cooking like salt & chilli powder .So i buy it every month along with other groceries without fail.But once i wanted to prepare at home and see the output.I have never thought, homemade Garam Masala Powder tastes and smells sooo good equivalent to store bought ones.Its so easy and comes out with superb flavour.As u all know,there are many varieties of Garam masala powder.People in Karnataka,Kerala,Punjab and Gujarat have their own style of making.Soon i’ll share those recipes from my friends.This is just a general version of making garam masala powder at home for beginners.I have given only limited quantity of ingredients.If u like this recipe,u can make in bulk and store it in an air tight box.Just a tsp of it would be enough to make a flavourful gravy.I tried this recipe after referring some store bought masala packets and my cookbook.I used red chillies in this recipe.So it tastes mildly spicy too.It smells & stays good for months when handled with care.U can also refrigerate but it may not be necessary. Here is a picture of ingredients i have used in this recipe.Hope u’ll try and like this recipe . 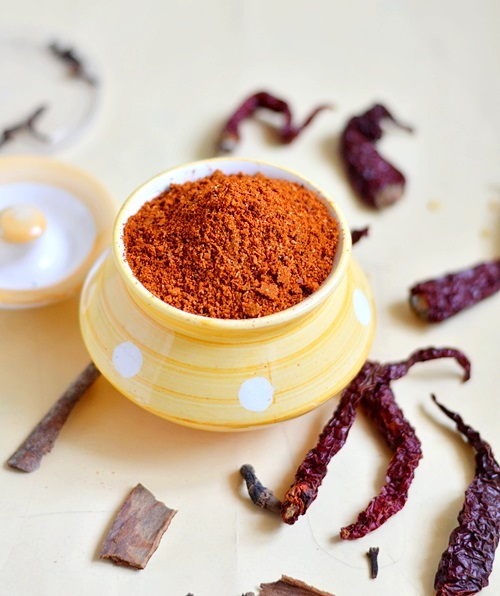 Break the nutmeg into small pieces.Pinch the red chillies.Dry roast all the ingredients given above in medium flame till u get a nice aroma without changing the color.Take care u don’t burn them.U can also roast them individually. Grind everything to a fine powder adding salt after it cools down.No need to sieve. Store in an air tight box after it cools down completely.Use a clean spoon every time and close the box tightly after use to retain its smell. U can use a small piece of dry ginger if u don’t have its powder in hand.In that case,break the ginger into very small pieces before roasting. Grind only after all the ingredients cools down completely else small lumps may form. For variations,u can omit red chillies. 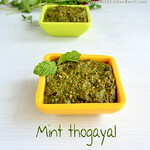 U can also try adding few stone flowers/Kalpasi and one Marati moggu for more flavor.